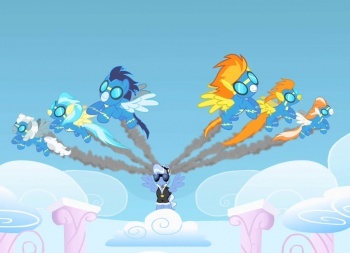 It turns out that My Little Pony: Friendship Is Magic inspires students literally training to fly at supersonic speeds. While I've never personally seen an episode, there's a lot of love out there for My Little Pony: Friendship is Magic. The cartoon's popularity has grown by leaps and bounds since it launched four years ago, and even our own Moviebob admits that it's a cleverly well-written series. In fact, My Little Pony is so influential that even those who defend real-world airspaces are inspired by its message of teamwork. Fansite Equestria Daily recently reported that an entire Air Force unit was spotted wearing patches that suspiciously mimicked the cartoon's trademark logo. An Vance Air Force Base spokesman later confirmed that its airmen-in-training are indeed sporting pony patches, and went on to justify the apparel like a true brony. "We train world-class pilots who will go on to defend our great nation," said First Lieutenant Tom Barger. "Fostering camaraderie, morale and unity on a regular basis and through small means - like a tastefully humorous patch - enhances our ability to complete the mission when working as a team is essential." Vance Air Force Base is one of four locations where officers train to become professional pilots for the Armed Forces. Shortly after arriving, each group of students designs their class patch to be worn during training, and pop culture references are naturally common. Hangover, Facebook, and "Got Milk" designs have all been used in the past, but this time Hasbro was the only company that approved one Friendship Is Magic-inspired logo. 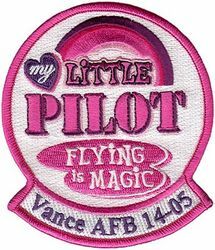 "During a slide show presentation while previewing the different patch options, the presenter threw the 'My Little Pilot' patch design into the mix as a joke," Barger explained. "For whatever reason, that patch made it all the way through the approval process." And so, even though the students weren't actually My Little Pony fans, the Brony Squadron was born. "The class never really wanted it in the first place," Barger stated, although over time the squadron grew to appreciate the companionship its design implied. "They thought it was so off the wall that it was hilarious ... They have embraced the irony and humor of the patch and in so doing have fostered closer ties with each other." Either way, I suspect these bronies won't be teased quite like Friendship Is Magic fans have been in the past. When the person you're mocking is literally capable of strafing your house at the speed of a Wonderbolt, your only options are to either shut up, or compliment their pretty pink patch.